What is an OCO order? You are here: Home > Trading FAQs > What is an OCO order? OCO stands for one-cancels-the-other and as the name hints, a one-cancels-the-other spread betting order empowers you to link two simultaneous opening orders so as to take on two views on the same market. When one of the two orders is triggered, that order is executed while the remaining order is automatically cancelled. Let’s say an announcement on the non-farm payrolls numbers is due for release at 1.30 and you want to trade on the back of these numbers. The FTSE index is currently at 5600, so you decide to place an OCO order to buy at 5650 and another to sell at 5550. That way, whichever order is triggered first is executed, while the other order would be automatically cancelled. This would allow you to enter a trade whichever way the market goes. Of course you can also use OCO (one-cancels-the-other orders) on stop losses and limit orders. For instance, if you thought that the FTSE was set to rise, you could buy the FTSE 100 index at say, £10 per point on 5600 and place an OCO order to close your spreadbet at 5550 or 5650, whichever price level was hit first. 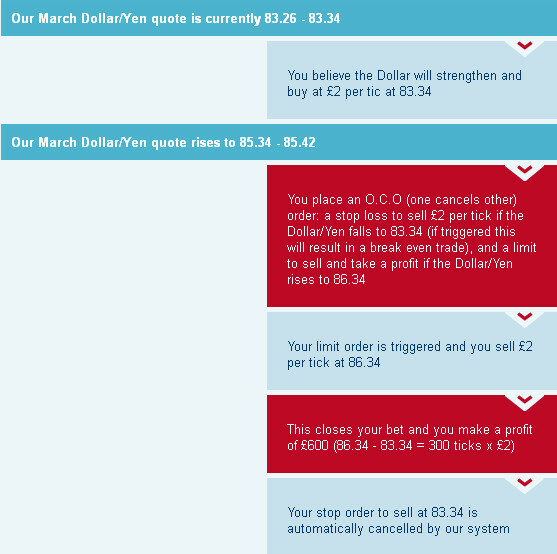 You place an O.C.O (one cancels other) order: a stop loss to sell £2 per tick if the Dollar/Yen falls to 83.34 (if triggered this will result in a break even trade), and a limit to sell and take a profit if the Dollar/Yen rises to 86.34.